Pulling aquatic weeds and getting kids on the water in the upper St. Croix watershed. Heidi Fettig Parton is a participant in the St. Croix Master Watershed Steward program, and is producing profiles of St. Croix stewards for her capstone project. Here is the first installment. This past summer, Scott Peterson spearheaded a project to remove yellow flag iris, an aquatic invasive species, from the Upper St. Croix River. While yellow iris doesn’t look all that different from the blue irises found in your own garden, except when flowering, it’s actually quite menacing. Yellow iris is poisonous and this noxious plant outcompetes native species, altering the habitat critical for more desirable native plants and animals. I met with Peterson on the Upper Namekagon River, just north of Spooner, Wisconsin. It was chilly on that morning in late September and Peterson dressed in layers under a warm red and black plaid insulated shirt, worn with jeans and hiking boots (later, he’d exchange the boots for hip waders). A swatch of disheveled white hair crowned Peterson’s head. While many retirees were likely out on the golf course, Peterson was at a landing on the Namekagon River. He wasn’t fighting yellow iris that morning, but was putting middle school children on the river through his Canoe On Wheels (COW) program. Once Peterson had safely launched the students, their teacher, and the volunteer chaperones to a day on the river, Peterson and I sat down at a lone picnic table located close enough to the Namekagon to hear and see its waters moving downstream. Peterson, a longtime resident of Minneapolis and cabin owner on Gordon Flowage—near the headwaters of the St. Croix River—was doing just that, protecting the river, when he began the process of tackling yellow flag iris infestations found in waterways along the headwaters of the St. Croix. Yellow iris was first introduced, from Eurasia, as an ornamental plant for water gardens. It was also deliberately planted in wetlands to help reduce erosion and absorb metals. This rather large perennial can grow two to six feet in height. Yellow iris typically blooms from April to June. Angelique Dahlberg, Invasive Species Coordinator for the St. Croix River Association, told me that its fruit capsule contains seeds that float on water. Spreading through the water, yellow iris can reproduce over long distances. At the same time, yellow iris also reproduces through its rhizome root system. Although considered an invasive species, yellow iris can still be found in ornamental gardens across Wisconsin and Minnesota. Unfortunately, yellow iris can escape the boundaries of its intentional plantings and, because it’s resilient in a broad range of environmental conditions, it has proliferated in recent years. 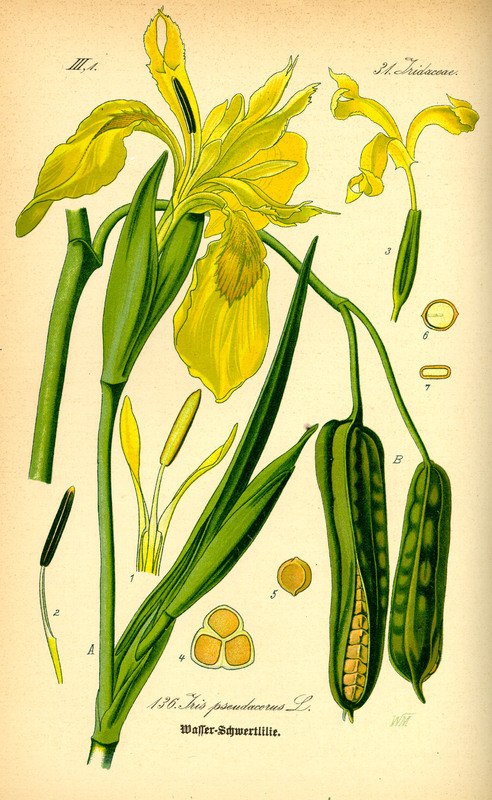 Peterson had been observing the growing infestation of yellow iris in recent years. When he saw that it was encroaching upon the St. Croix River, via its source waters of Upper St. Croix Lake, Peterson, along with the Friends of the St. Croix Headwaters (FOTSCH), decided it was time to take action. “When I see a problem, I ask myself, what can I do to solve this problem?” Peterson, a retired systems analyst, is no stranger to problem solving. He’s always been fascinated by how systems work, but in retirement, he’s turned that fascination toward the study of lake and river ecology. I asked Peterson if it was possible to fully eradicate the yellow iris. Peterson acknowledged the immensity of the challenge. It’s simply not feasible to pull out all yellow iris plants, which tends to grow in self-created mats along the upper river ways. When growing in these mats, yellow iris is hard to reach and it is especially difficult to get at its root system. To complicate matters, yellow iris typically grows in conjunction with purple loosestrife, another troublesome aquatic invasive species. Although yellow iris can be treated with herbicides, it grows near (and, increasingly, intermingles with) wild rice. Many counties and tribes prohibit the use of herbicides in wetland habitats and so yellow iris has to be pulled by hand. I wanted to know how he remains hopeful in the face of such a long-term challenge—perhaps even an impossible one. Peterson paused to observe a stick-like inchworm, advancing slowly across the picnic table, before thoughtfully answering. Peterson’s words will continue to echo in my head for days, perhaps even months, after meeting with him. He’d sounded a call to action. To fund the removal project, Peterson went to the DNR, and a few other sources, “begging” for money. FOTSCH raised $10,000—according to Peterson, a relatively small amount—for the pilot removal undertaken this past June. Peterson is a firm believer in pilot projects. His Canoe on Wheels program also got its starts as a small pilot project. He spearheaded the idea for COW when he learned that kids living near the St. Croix headwaters were graduating without ever having been out in a canoe or kayak. COW began by raising funds to buy a portable canoe rack. From there, it sought out organizations—even towns—to donate canoes and other necessary safety gear. COW continues to raise funds so that it can provide paddling opportunities to schoolchildren free of charge. “Pilot projects help an organization figure out best practices,” Peterson told me. Peterson told me that a big “takeaway” from the yellow iris removal pilot has been a greater understanding of the value of partnering. For the pilot removal, Peterson and FOTSCH partnered with the Upper St. Croix Lake Association because the first few miles of the St. Croix River consists of lake water and prevailing summer winds blow the yellow iris back up into the lake. 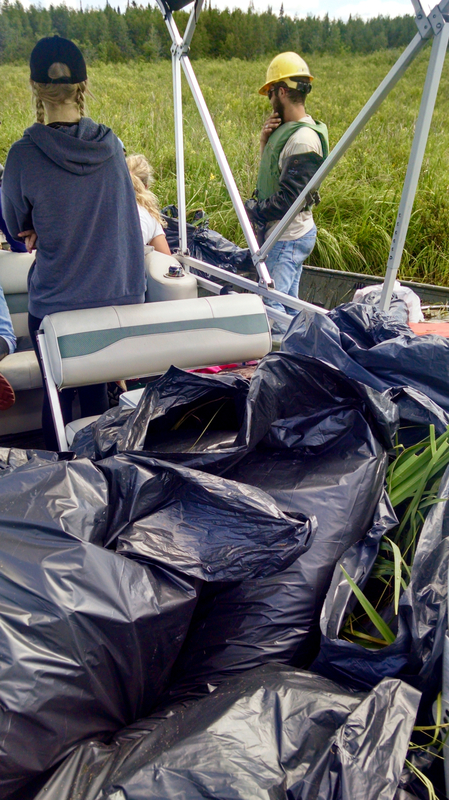 With the pilot removal project, individual members of the lake association donated the pontoon boats needed to haul away the glut of heavy plastic garbage bags filled with the muddy biomass of harvested plants. Not just anyone can harvest yellow iris. Its removal typically requires a permit and certain prescribed procedures must be followed. FOTSCH hired botanists from the Lake Superior Conservation Core to cut the irises and enlisted area high school student volunteers to help haul away the plants gathered during the three days of concentrated cutting. It is essential that all parts of the plants be removed from the water to prevent spreading. The yellow iris removed during this pilot was taken to transfer centers to be burned. For this part of the process, FOTSCH partnered with both the village and town of Solon Springs to meet the pontoon boats at designated landing sites with front loaders to move the heavy, waterlogged bags of yellow iris to transfer centers. “It’s hot, messy work,” Peterson assured me. According to Invasive Species Coordinator, Angelique Dahlberg, you can also help out by reporting yellow iris, or other suspected invasive species. Don’t worry about wrongly identifying species as invasive. The experts are happy to look at your photos, which you can upload to the Great Lakes Early Detection Network, GLEDN, on its website or through a downloadable App that makes reporting easy. Through greater public reporting, we can all play a role in keeping aquatic invasive species from overtaking the St. Croix and its watershed. Great work! Scott is a tireless volunteer for our rivers in Northwest, Wisconsin. Thanks. Thanks John! We need more people like Scott in this world. He is a true river warrior and, as you say, a tireless volunteer. I can honestly say that the small bit of time I’ve spent with Scott has caused me to reassess my own beliefs about what I can do in this lifetime!